Save your projects for re-ordering or editing. re-order business cards for all of your employees? 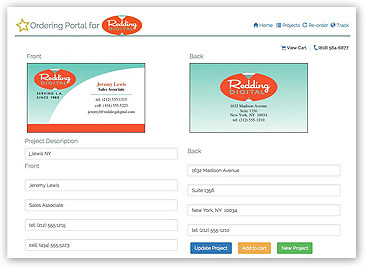 Business Card Star can set up your company's custom template and create an ordering portal just for your company! Keep your branding consistent with our easy to use online business card editor loaded with your company's business card artwork. We'll set up a private design and ordering page just for your business. 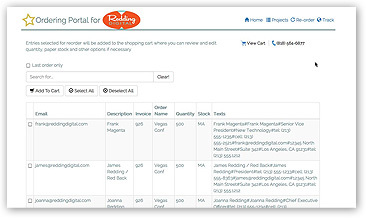 Adding new employees is a snap, and multiple orders can be processed at once. Please contact us to see if our corporate web-to-print business card service is right for your company. We take your existing design and create an online business card portal just for your company! • Transform your business card artwork into online templates. • Your customized template(s) will be available to your account only. Once you are approved, you'll need to provide your artwork for review. We accept Illustrator, PDF, Indesign, and Photoshop formats. 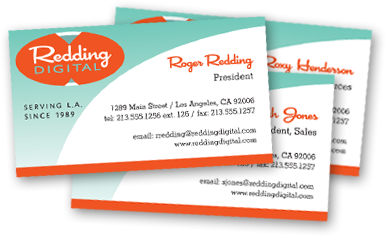 Your business cards must use a horizontal standard business card size (3.5" x 2"). We'll incorporate all non-changing elements into the online template. This will help keep your branding consistent. All text that is changed for each employee can be changed allowing you to order and re-order cards for each employee. Contact us if you have any questions about this service, or if you'd like see if this solution is right for your company.